It's finally here! 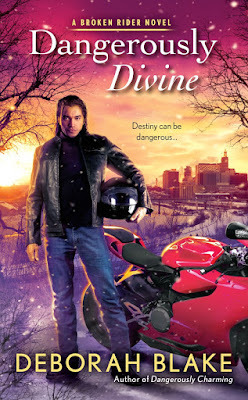 Today is book release day for Dangerously Divine, the second book in the Riders series. Magic the Cat is very excited, as you can see. Are you? Be sure to let me know if you read the book and like it. And don't forget, the best way to help your favorite authors is to leave reviews (well, and buy books, of course). I'm also giving away a $25 Amazon gift card over at the blog, so be sure to enter the contest after you read the short story. I'd love, love, love it if you'd come back here and tell me what you thought! But do come back here and tell me if you read the story, and if so, what you thought! Happy Black Friday all. I'm off to work at The Artisans' Guild. I have exciting news! I’ve decided (okay, been persuaded) to start a Patreon page. 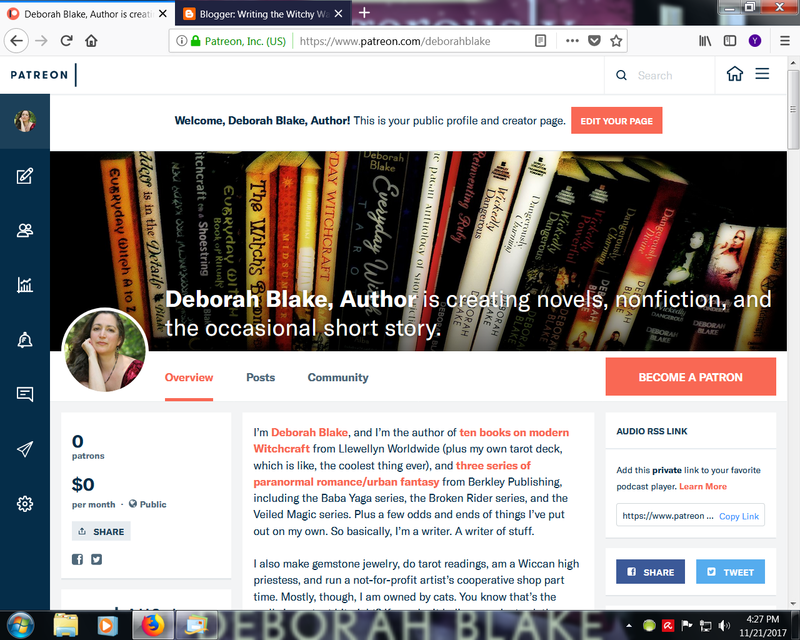 For those of you who aren’t familiar with Patreon, it is a way to support the authors (or artists, or various other types of creative people) whose work you enjoy. It is very simple. Patrons sign up to make a monthly contribution (as little as a dollar a month) to the “creator” of their choice, and in return get various rewards that are not available to the general public. The greater the monthly pledge, the more exciting the rewards. Needless to say, not everyone can afford to do this, or will have any desire to support their favorite authors by doing anything more than buying books and leaving the occasional review. That’s just fine. But for others, it is an opportunity to be a part of the creative process, support folks they admire, and get fun and interesting rewards in the process. And those they support get to do what they love and worry just a little bit less about money. To be honest, the deciding factor for me was the recent insane vet bills for my beloved cats. (Mystic is on a medicine that costs, I kid you not, $300/month. But without it, he wouldn't be here.) I didn’t want to do a Go Fund Me and just ask for money, and I’d already been playing around with the idea of doing a Patreon page, since it allows me to give back to the folks who support my efforts. It’s something of an experiment, and we’ll see how it goes. But in the meanwhile, here it is. Feel free to follow this link and see what it is all about! It's almost here! Those of you who read Dangerously Charming back when it came out in October of 2016 have been waiting patiently for the second book in the Broken Riders series, and your patience is finally going to be rewarded! Dangerously Divine, Gregori's story, is coming out on November 28th, and I don't know about you all, but I am a little excited! So naturally, I'm doing a big ol' giveaway. There are three prizes: a $25 Barnes & Noble gift card, a signed copy of the book, and the grand prize of a Kindle Fire 7 Tablet. Woot! I think Magic the Cat approves. Fresh Fiction (November 21-Dec 15) $25 Amazon card Giveaway! Literary Escapism (November 24th) Short short story about Gregori & $25 Amazon card Giveaway! The Qwillery (November 25th) Excerpt and $10 Amazon card Giveaway! I Smell Sheep (November 26th) Spotlight and $25 Amazon card Giveaway! But in the meanwhile, be sure to enter my giveaway here too. As always, no purchase is necessary, and all you have to do is fill out the Rafflecopter form. Yes, you get credit for things you have already done, like following me on Twitter (you do, don't you?). Counting down the days until Dangerously Divine is out in the world! I'm launching a Patreon page to help support the cats and my writing. (This is a thing where people pledge monthly support to someone who creates some form of art, like writing.) And I'm wondering what rewards people would like for the various levels of support. Here's your big chance, people--tell me what you want, what you really, really want! I put a poll up at the top of the page, and it will run for about a week. The options there are what I've been thinking about doing, but I am open to suggestions. (The way it works, everyone gets the simple rewards, no matter how much they pledge, and the more you pledge, the fancier the rewards get.) I'm also open to suggestions. So tell me what would get you excited about supporting my work? Come on now, tell me what you want! ETA: If you click "other" in the poll, leave a comment here to say what it is you want. The Broken Riders series is a spin-off from the Baba Yaga series, and follows the three Riders introduced in those books. DANGEROUSLY CHARMING, the first in the series, was Mikhail's story. DANGEROUSLY DIVINE follows the adventures of his brother Gregori Sun, the Red Rider. I had a lot of fun writing this book, which is set in Minnesota. (Fun fact: that's where my witchcraft book publisher, Llewellyn, is located, so I was able to pick the brain of my nonfiction editor for info for my fiction.) I really adore Gregori, although he isn't as flashy as his two brothers. Who is your favorite? Just in case you need to catch up, I'm going to give away a copy of the first book, PLUS an ARC (advanced reader copy) of the new one! Plus, I have a couple of those cute key rings I had made for Dangerously Charming, so I'm going to throw one of those in too. Let's get this party started. Only 3 of these left! You might have to fight Magic for this one. She seems to think it is a cat toy. As always, just use the Rafflecopter form below. You get credit for anything you do already (like following me on Twitter and signing up for my newsletter) and extra credit for leaving a comment, or a few other things. (Just as a note: Dangerously Charming hasn't had a review in EIGHT MONTHS! Sniffle. So if you read it and liked it, I'd be forever grateful if you'd pop over to Amazon, Goodreads, or B&N and leave a quick review. It doesn't have to be long or fancy.) No purchase necessary. Although I'll be pretty happy if you preorder the book, of course. And watch this space, because there are all sorts of other good things coming up as we get closer to release day! I know most people do their major “big clean” in the spring, but I’m actually a fall cleaning kind of girl. In the weeks leading up to Samhain (Halloween), as it starts to get darker and colder, I am always seized by the urge to do a deep clean of all the rooms in the house, straighten up and rearrange any clutter, and get rid of stuff I no longer use or need. I’m not sure if this is because on some level I know I’m about to be stuck mostly inside the house for the winter, or if it is a more spiritual urge brought on by the ending of one year and the desire to start clean for the next. (Samhain is considered to be both the end of the year and the start of the new year in the Pagan Wheel of the Year). Either way, I start by dusting and rearranging my altars, and the shelves where I store and display my stones, cute little cat and dragons, and all the rest. Then I go through each room and do a much more thorough clean and neaten than usually gets accomplished in my weekly Saturday house cleaning. Ah! It feels so good to have everything (okay, most things) nice and tidy, at least for as long as it lasts. The shelf over the couch. The desk in the dining room and another shelf. Look, you can actually see the surface of the desk! This is also the time when I do my yearly protection spell on my house and property, preparing it for the seasons to come. Do you do a spring cleaning, a fall cleaning, or something else entirely? The stone circle behind the barn, weed-whacked and ready for ritual on Tuesday.